'Shaggy Dog' was presumed missing, believed wiped (that's archive parlance for 'they chucked it out') and it recently was discovered lurking in the archives when those lovely fellas at Kaleidoscope were researching one of their invaluable drama guides. 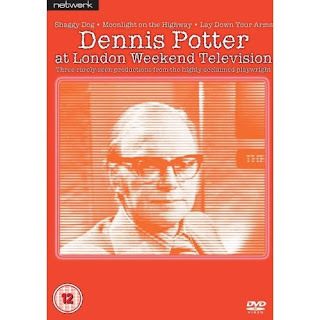 It's now been released on DVD as part of a second volume of plays by the late, great Dennis Potter that were commisisoned by LWT. The play is one of a series called 'Company Of Five' and heralds from 1968. It's a macabre, blackly comic look at management consultants, the cod pop psychology that infected British business practices in the late 60s and early 70s and the general social malaise that eventually brought us the three-day week. Mr. Wilkes, played wonderfully by John Neville, attends an interview for a job in management at a hotel chain. He's not only going to be grilled by the personnel manager, Mr. James (the avuncular Cyril Luckham) but he's also going to get the third degree from a poncey looking management consultant Mr. Parker (Derek Godfrey) who believes that he'll find the right candidate by firing off questions about bed wetting and parental relationships. Needless to say, Mr. Wilkes is already suffering from some kind of depression and the interview is a tragic disaster. It's not in the same league as 'The Singing Detective' or 'Pennies From Heaven' and if you come to this expecting something similar then you are in for a rude awakening. It's certainly a play that fits into Potter's attack on mass media and the leisure industries and the failure of industry in Britain. His obsessions with this subject matter can be found in plays as diverse as 'Paper Roses', 'Follow the 'Yellow Brick Road' and 'Only Make Believe' and the character of Wilkes is essentially his mouthpiece here in his vilification of the hotel chain's rise from a cluster of down at heel transport cafes. Wilkes obviously finds the words 'leisure industry' something bad tasting in the back of his mouth. It's a bizarre play with an astute view of the faux-glamour of late 60s Britain as espoused by the dolly bird secretaries and the weird office with its over abundance of modern (for the time) suites filled with tropical plants. This is a Britain in decline with industry straining to paper over the cracks. Derek Godfrey is superb as the horrific Parker who decides to don a blonde wig throughout Wilkes' interview in a bid to unsettle him with questions about his mother and disorientate his view of the sexes which is a typical Potter trait. This comes over as cruel a piece of 'Monty Python' comedy of embarrassment as you'd ever want and much of the attack on consultants and business speak reminded me very much of the later and equally surreal 'Fall and Rise Of Reginald Perrin'. Wilkes is recovering from a nervouse breakdown and his place in the narrative is to get to tell his 'shaggy dog' type bad joke which he's obviously been straining to get to the end of. Parker's insensitivity tips him literally over the edge. The fact that the punchline is both hilariously bad and leads to Wilkes emphasising it by throwing himself out of a window to his death is perhaps Potter viciously underlining the way the public and the private worlds do collapse into each other with horrific consequences for those sensitive souls who simply aren't able to navigate their way through an increasingly complex, media saturated work place. There's an extract from a South Bank Show from 1978 which I watched straight after the play and in it Potter, as ever very erudite, uncannily predicts the ultimate descent of television drama into the 'soap by numbers' formula that holds sway today. It is clear that in the current climate it would be very unusual that such a unique voice as Potter's would now get airtime. Thankfully, we can get to see some of his work on this DVD and you'll find two other fascinating plays on this volume and a further South Bank Show extract from 1979.